Michelle Szabo, RMT is an ordained priest, Reiki Master Teacher, designer, artist, musician, author, teacher and mother. She spends her free time with her children, painting, singing, reading and discussing life with Dr. Grega — when he's not pulling her leg...;) Connect with Michelle on Facebook or Twitter. Dr. Dennis Grega, originally from Saturn, enjoys time on Jupiter, plans to project astrally to locate the library of Alexandria and then time travel to it to add to the library collection. He also fully enjoys pulling Michelle's leg, with all three of his arms. Connect with Dennis on Facebook. 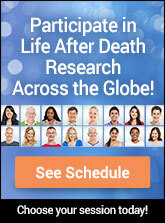 The Creator of Afterlife101.com, who has chosen to maintain anonymity, is also a major contributor to AfterlifeData.com. His wife is an accomplished medium and advanced spiritual entities speak through her to dictate the contents of their on-line book. This book concludes with a summary chapter of its contents, containing 265 "key findings" of the afterlife. These key findings form the detailed baseline against which quotes from all other spiritual sources are compared. Dr. Michelle Wareing is an academic researcher based in the UK. Her main interest is in studying the Afterlife and focusing on how science and spirit can work together in order to find a wider and deeper understanding of consciousness and spirituality. Michelle is also interested in life between lives hypnotherapy and near death experiences. Kelly Wright, also based in the UK, is currently studying for her degree in Fine Art. Kelly has a keen interest in the Afterlife as well as in psychic art and artists and is currently developing her skills as a spirit portrait artist. Each of these contributors can be reached through our contact page. Simply address your comment to the appropriate person.